Keith Williams, who is heading a year-long review of UK railways, has refused to rule out nationalisation as a possible recommendation to government. Mr Williams is a deputy chairman of John Lewis Partnership and former chief executive of British Airways. “I am independent, for me all options are on the table. I think we should look at everything,” he told the BBC. His review was established to suggest the most appropriate organisational and commercial frameworks for the rail network. However, transport minister Chris Grayling does not entertain the idea of nationalising the rail network, preferring the review to “more effectively balance public and private sector investment”. Mr Williams’ findings and recommendations will be published in a government White Paper in autumn 2019, with “reform of the sector” to begin in 2020. “What I see in the rail system is a loss of public confidence, a loss of public trust, and hence the need for the review, because at the end of the day the rail network works for the consumer, the passenger,” Mr Williams said. 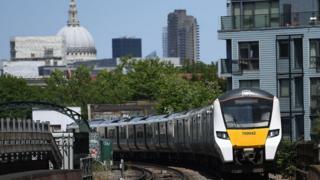 He said he did not want to point the finger at who, or what, might be responsible for the current unsatisfactory state of affairs, adding that the rail system “has been flawed at a number of levels”. Mr Williams added: “There is a measure of success in the railways. The number of passengers has increased, the investment has increased significantly, but that isn’t leading to greater passenger satisfaction. He said that Britain’s railways had a great history, but that the network now needed to be fit to meet the demands of the 21st Century. “My issue is not around the past, my issue is making sure we have something that works for passengers into the future,” he said. As well as passenger satisfaction he said the review also had to look at the rail network in a broader context, including economic and environmental issues. “It is the engine of economic growth for the country,” he said.